Former Israeli General and Prime Minister Ariel Sharon passed away a couple days ago. Like many, I have mixed feelings about the man's legacy. More than just a brilliant strategist, Sharon was known for his strong-will and over a long military and political career, he managed to piss-off just about everyone at one point or another. I've never played any proper wargames, like WFB, WH40K, etc. But I did spend many an hour at classic RTS computer games like Dune 2, Command & Conquer, and Warcraft, not to mention many sessions of my friend's simplified version of Axis & Allies, and of course way too much XCOM. So I do very much like strategy. In any case, I wanted to present his part in the 1973 Yom Kippur War between Egypt, Syria, and Israel(though he also played significant roles in the wars in 1947, 1956, 1967, 1982). 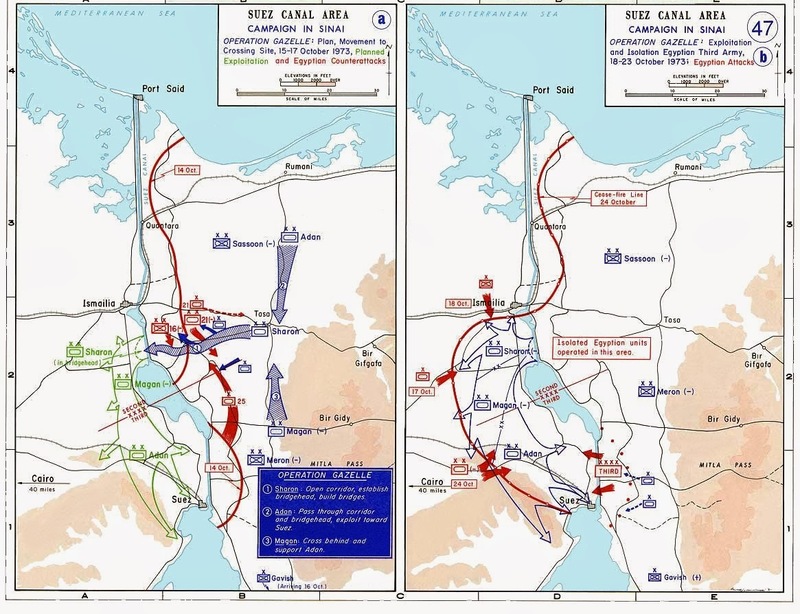 The war began with Egypt's surprise attempt at re-capturing the Sinai peninsula, while at the same time Syria attacked Israel from the North, hoping to re-capture the Golan Heights. 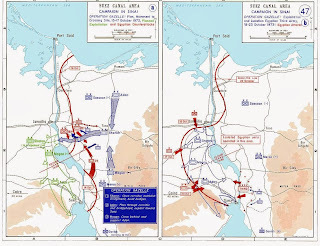 Things started-off well for the Egyptians: they crossed the Suez Canal, routed the defenders, neutralized Israeli air support, and repelled a counter-attack by Israeli armour, inflicting heavy casualties all the way. The tide turned as Egyptian troops advanced into the peninsula, taking heavy casualties from fortified Israeli armour. The Egyptian forces withdrew to more fortified positions, hanging on to the captured East side of the Suez Canal and it looked like the bloody beginning to what would be a violent and protracted conflict. Knowing that time was against them, the Israeli generals decided on a desperate surprise move. A single armoured division would punch through the weak spot in the Egyptian lines between the Second and Third Armies. They would race to the Suez Canal and have to build a bridge over night, under heavy fire. This bridge would allow two other armoured divisions to cross-over into Egypt proper, flanking the Third Army and giving Israel the leverage to force a cease-fire. Needless to say, the Israeli armoured division building the bridge would probably take heavy casualties and if the Egyptians reacted quickly, would be sandwiched between the oncoming Second and Third Armies and probably destroyed entirely. And the Tank Commander leading that Division was, of course, Arik Sharon. The man definitely had guts.